The Barkhor is probably the best part about Lhasa and one of the most interesting places to see in Tibet. The Barkhor is a pilgrimage kora around Tibet's most holy temple, the Jokhang. The main circuit of the Barkhor is about 1km long, but there are many small alleys that come off of the main route. 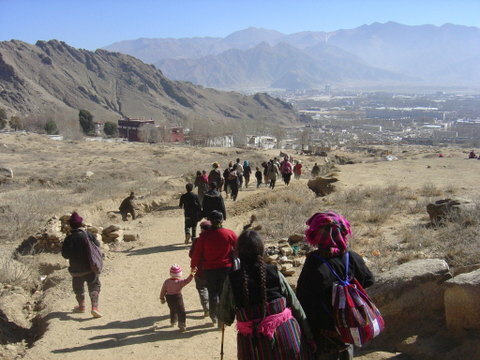 Everyday sees thousands of Tibetan pilgrims walking around the Barkhor in a clockwise direction. Lined with shops, the Barkhor is one of the best places to pick up Tibetan souvenirs. With knives, prayer wheels, Buddhist statues, jade jewelry and the latest music from India, there is something for everyone. 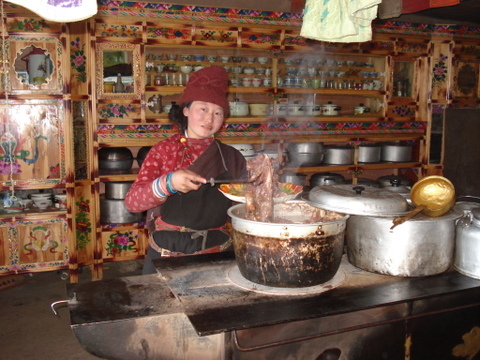 Along with countless shops, there are also many restaurants serving authentic Tibetan food. While these places usually don't have English menus (or any menu for that matter), they are a great place to go to try some Tibetan cuisine. 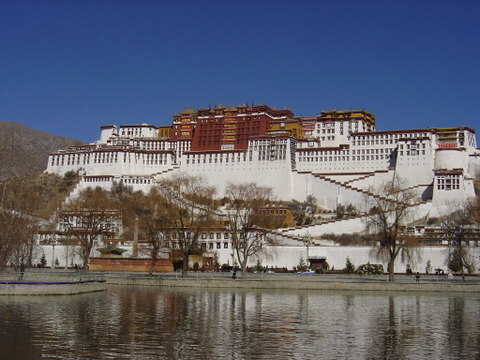 The Barkhor sits in the heart of the Tibetan district of Lhasa (yes, it is sad that Lhasa has to have a Tibetan district). Traditional style Tibetan homes, the kind found in this region of Tibet, line each side of the road around the Barkhor. Several small temples are also found along the Barkhor such as Mani Lhakhang, Jampa Lhakhang and Meru Nyingba. Along the southeast corner of the Barkhor lies the Muslim district of Lhasa where a large mosque is found. Surprisingly, Lhasa has quite a large Muslim population. Uyghurs from Xinjiang province as well as Hui from Gansu and Salar from Qinghai provinces can all be found in Lhasa operating noodle restaurants, serving as butchers and selling dried fruit. Being around all the pilgrims on the Barkhor is a unique experience. Seeing the spinning of hand held prayer wheels and hearing the constant chanting of Tibetan prayers gives the Barkhor the characteristics that have made it one of the most famous places in Tibet. When you go to Lhasa, spend some time wandering around it. Don't just walk around it once or twice, but spend some serious time observing the Tibetan people as they walk past you. It is an experience you will never forget. Day 1: Take the train from Xining (elevation 2300m) to Lhasa (ele. 3550m). The train takes just over 25 hours and goes through the Tibetan areas of Amdo (northeast Qinghai province) before heading south through Golmud, Nagchu and arriving in Lhasa. The scenery along this route is stunning. There are 3 classes of tickets for the train: Soft sleeper, hard sleeper and seat. Both sleeper classes are comfortable. Only take the seat if there are no sleeper tickets available. The picture below is of Jokhang Temple ( ཇོ་ཁང་). Day 2: Arrive in Lhasa from Xining. Most of the trains from Xining and the rest of China arrive in Lhasa between 6:30pm and 9:45pm. Day 3: Stay in Lhasa. You can go to the famous sights in Lhasa such as The Potala Palace, Jokhang Temple, Sera Monastery, The Norbulinka, Drepung Monastery and Barkhor Square. It is wise to spend at least a few nights in Lhasa to acclimatize before heading to higher elevation places along the Friendship Highway. Day 4: Stay in Lhasa. Day 5: Go from Lhasa to Gyantse (ele. 4000m) via Yamdrok Lake . Yamdrok Lake is one of the most beautiful lakes in Tibet. The lakes sits at 4450m and has an excellent view of Mt. Nojin Kangtsang which rises to 7191m. From the lake, you will descend down to the city of Gyantse (རྒྱལ་རྩེ་), which is home to the Gyantse Kumbum, the largest stupa (chorten) in Tibet. In Gyantse, you can also visit the the historic hilltop military fort. There are several good hotel options in Gyantse. 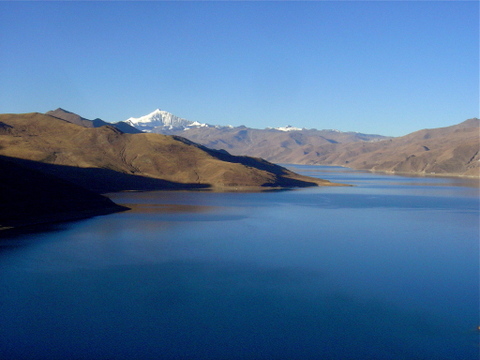 The picture below is of Yamdrok Lake. Day 6: Go from Gyantse to Shigatse (ele. 3900m). Shigatse (གཞིས་ཀ་རྩེ) is the second largest city in Tibet and is home of Tashilhunpo Monastery. There is excellent hiking around the monastery and several good markets in town to purchase souvenirs. There are many hotels to choose from from budget to 4 star. Day 7: Go from Shigatse to the small village of Tashi Dzom near Mt. Everest via Sakya Monastery. Sakya Monastery is the head monastery of the Sakya sect of Tibetan buddhism. The fortress like monastery is very unique in Tibet. There is good hiking on the mountains behind the monastery. Tashi Dzom (ele. 4350m) is a small village with not a lot to do, but it serves as a good point to spend the night at before making the final approach to Mt Everest Base Camp. On the drive from Tashi Dzom to Base Camp, there are good views of the Himalaya Mountains. Accommodations in Tashi Dzom are limited to basic guesthouses. The picture below is at the Kumbum chorten in Gyantse. Day 8: Drive from Tashi Dzom to Mt. Everest Base Camp (ele. 5200m). The drive to Base Camp crosses over a high mountain pass which gives an excellent sweeping view of the Himalaya's. 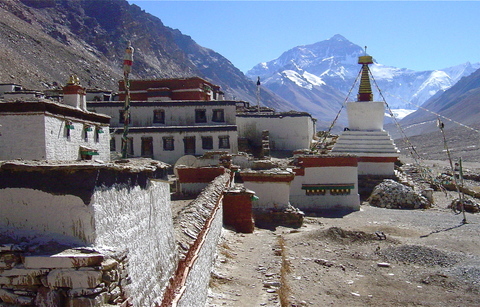 Rongbhu Monastery, the highest monastery in the world at 5000m, is 8km before base camp. There is a small guesthouse at the monastery as well as well as the "tent city" near base camp that offers beds in traditional style Tibetan tents for around Y40 per person. The picture below is taken at Rongbhu Monastery with Mt. Everest (ཇོ་མོ་གླང་མ) in the background. Day 9a: With Day 9 there are two options to choose from. The first option is to go from Mt. Everest Base Camp to the Nepal Border at the small town of Dram (known as Zhangmu in Chinese). The border is not open 24 hours so you may have to spend the night here and then cross the border the next morning. You can cross the foot bridge over the border into Nepal and then take a bus or taxi into Kathmandu. Vehicles from Tibet normally cannot drive into Nepal. From the border to Kathmandu will take around 4 or 5 hours. There are several decent hotels to choose from in Zhangmu with places to exchange money into Nepali rupees. You can get a Nepali visa at the border. Day 9b: The other option is to return to Lhasa from Mt. Everest Base Camp. Day 9 you would begin to go back to Lhasa. You would go from Mt. Everest to the small town of Lhatse or Shigatse. Day 10: Return to Lhasa. There are other reasons to visit Lhasa in the winter. Lhasa receives around 275 days of sunshine per year. The sun often shines high and bright in the winter. Many pilgrims from across Tibet go to Lhasa on pilgrimmage in the winter, especially around Losar (Tibetan New year). Lhasa looks and feels much more "Tibetan" during this time. Getting train tickets to Lhasa are much easier in winter than in the summer. Prices for hotels and trips outside of Lhasa are cheaper during this time. Many places outside of Lhasa are still accessible in the winter. It is still possible to go to Everest and take tours down the Friendship highway to the Nepal border in winter. During the summer there are large crowds of tourists everywhere in Lhasa. During the winter, there are far fewer tourists. If you are planning a trip to China this winter, don't be afraid to add Lhasa to your itinerary. If you are looking to take a vacation this winter in Asia, why not go to Lhasa? Don't let the slighly cool temperatures stop you from taking this once in a lifetime trip! Jokhang Temple is easily Tibet's most holy and revered sight and is one of the most visited places in all of Tibet. Pilgrims from all ends of Tibet can be found walking around the temple every day of the year. During Losar (Tibetan New Year), tens of thousands of Tibetans make their way around the temple. Jokhang was built in the early 7th century. The temple was constructed under the orders of the famous Tibetan king Songsten Gampo. The temple was built to house an image of Mikyoba, given to Songsten Gampo as a wedding dowry from his Nepali bride, Princess Bhrikuti. The king was also given another buddhist image of Jowo Sakyamuni by his Chinese wife, Princess Wencheng. This image was originally housed in Ramoche monastery (a few hundred meters from Jokhang Temple), but was later moved into Jokhang Temple where it still is to this day. Even with all the changes that have come about in Lhasa over the past 50 years, Jokhang Temple is still one of the best places in Tibet to visit. In the morning, incense is burned in large incense burners in front of the temple. The distinct smell of this incense can be smelled all across the Tibetan district of Lhasa. 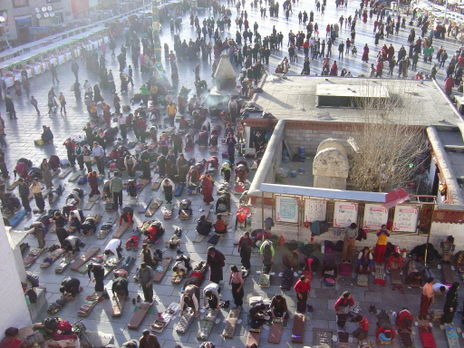 Even before the sun begins to rise, Tibetan pilgrims can be seen in front of the temple doing prostrations. In front of the temple to the left side is a small room that is filled with lit butter candles. All around the temple is the Barkhor. The Barkhor is an amazing kora of markets selling all things Tibetan. Pilgrims make their way around this kora all day long. 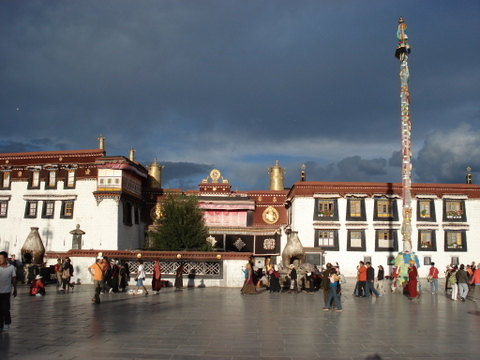 The roof of Jokhang is one of the best places to hang out in Lhasa. The rooftop gives you an excellent view of Barkhor square and a view of the Potala Palace in the distance. You can see all the pilgrims prostrating below. The Barkhor Square/Jokhang Temple region of Lhasa is one of my favorite places to be. I have walked around this area far too many times to count, but I never grow tired of it. Jokhang temple and Lhasa can be visited anytime of year, even during the winter. Sera monastery was founded in 1419 by a disciple of Tsongkhapa named Sakya Yeshe. Before a monastery was built in Sera, Tsongkhapa had established hermitages in the cliffs above. Over the years, the monastery grew to have close to 6000 monks. Sera and Drepung monasteries became the largest Geluk sect monasteries in Tibet. Today Sera has around 600 monks. 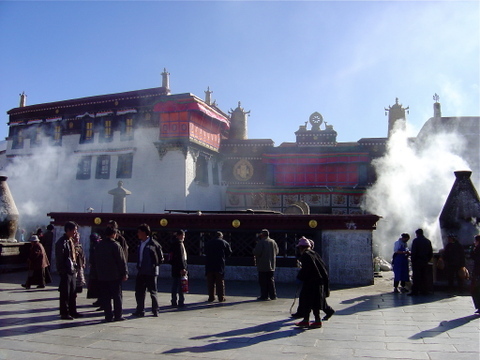 Sera monastery is famous for its "monk debates" which take place nearly everyday of the week. The monks gather each afternoon to debate buddhist teachings and philosophy (pictured below). 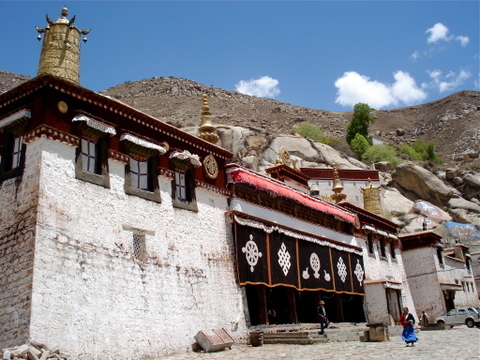 Though many monasteries across Tibet have debates, Sera is the best and most popular place to witness it. Sera monastery is only 5km from downtown Lhasa. It can be easily reached by bus or taxi. Sera is a common place for tourists to go so you are going to have to buy an entrance ticket (only the most touristy monasteries charge an entrance fee). It is best to go in the afternoon in order to see the monk debates. This is a view of the kora that goes around Drepung Monastery in Lhasa down to Nechung Monastery. Nechung Monastery was the former home of the Tibetan state oracle. During certain times of the year many pilgrims can be seen taking the route down to Nechung. This was taken close to Losar (Tibetan New Year). The capital city of Lhasa can be seen in the background. For this article I am going to write about Tibetan hospitality. According to Wiktionary hospitality is defined as "the act or service of welcoming, receiving, hosting or entertaining guests". Hospitality is something that Tibetans are very good at. I never cease to be amazed at the courtesies extended to me by nomads, college-aged students or by my Tibetan neighbors living in my complex. I am from the US (west coast to be precise) where we are not really known for our hospitality. I am familiar with the term "Southern Hospitality" and have experienced it to some degree, but even that is of no comparison to the hospitality found in Tibet (and really in most of Asia). When I was young, I read a few stories about people who would hitchhike across the US in the 1950's and totally rely on the hospitality of strangers to make it from one coast to the other. These people weren't free loaders. They would offer to work for the family in exchange for a ride, a hot meal or a place to stay for a few days. Many young people traveled across the States and Canada in this way. Back then it seemed that taking in people was something normal to do. Offering a ride to a hitchhiker was common. Inviting strangers to dinner wasn't weird. But times change. Most people in the US don't pick up hitchhikers. Most people don't stop to talk to people they don't know. Most people would never think of inviting someone over for tea or dinner that they had just met. Some people may argue that it is too dangerous to do those acts of hospitality and kindness in this day and age. I understand that (but I don't accept that as an excuse). But, in many regions of the world (even in some areas that are thought "dangerous") this type of hospitality is found everyday. I have been fortunate to travel to most corners of Tibet over the past 5 years. In 2006 alone I traveled nearly 25,000km (15,600 miles) overland through Greater Tibet. The hospitality shown to me was amazing. In December 2006, I did some research for The Discovery Channel among the nomads of northern Kham. For 8 days I spent my time with nomads who lived either in black yak hair tents, or in small mud brick houses. When I entered into their homes, they were always excited to see me. Even if they were busy doing work, they took time to sit down with me to talk. Within a minute or two of me arriving, a cup of milk tea or butter tea was in front of me. Every time I took even the smallest sip of tea, someone (usually the wife or oldest daughter) was there to refill my cup. Bread and candies were placed in front of me as well as some dried yak meat. I came to these nomad tents unannounced. They had no idea I was coming. At one place I visited, one of the older daughters began to cook up some yak meat just for me and my two Tibetan friends who were traveling with me (picture is above). Many of the families I interviewed during this trip offered to let me stay in their tents or houses free of charge. In 2003 my wife and I visited a good friend of mine who lived in northeast Amdo. We were in the area and decided to take the hour long taxi ride to his village (his village was actually only about 25km / 15 miles away, but it took over an hour due to horrible road conditions). The plan was to visit him and his family for a few hours or so and then head back to the county town. When we arrived, my friends family was so happy to see us. They had no idea we were coming, but were still excited that we came to visit them. We visited them for a few hours and then told them we had to get on our way back into the county town. Our friends had a puzzled look on their faces. They thought we were going to stay with them for 3 or 4 days...not just 3 or 4 hours! Even though we had shown up completely uninvited, they wanted us to stay with them for as long as we could. We kindly explained to them that we only had a short time to be with them and that we had to be on our way. They couldn't understand why we would only come to visit them for a few hours. My wife and I felt bad, but we really had to be on our way. In the US if people show up at your house uninvited, you will probably be annoyed with them. "Why didn't they give us a call before they showed up?? ", some may think. Most people in the US definitely wouldn't want people to stay with them 3 or 4 days having arrived uninvited. Tibetan hospitality is so much different than that of Americans. I have read many books about Tibetans who have went on pilgrimage to the capital city of Lhasa. Many of them live in places far from Lhasa and it takes them a year or more to walk there. The pilgrims often rely on other Tibetans for food and shelter while on the long pilgrimage. These pilgrims tell many stories of the Tibetan families that took them in during their journey. These families fed them, gave them a bed to sleep in and often gave them a little money or tsampa (roasted barley flour) to help them with the rest of their trip. This may have existed in America in the 1950's, but it is gone today. We have many Tibetan friends. Tibetans don't celebrate birthdays. Many Tibetans are not even sure when their birthday is (I once had a friend tell me that he was born either in the spring of 1981 or spring 1982. His father wasn't quite sure.). Since I am an American, birthday parties are a part of my culture. I always have a birthday party and invite between 25 to 35 of my good Tibetan friends to my house for a party. I always tell them NOT to bring me gifts. Since Tibetans don't exchange presents or even celebrate their birthdays, I wouldn't want to ask them to do something that was contrary to their culture. But every year almost all of my Tibetan friends bring me a gift. My office at my home is filled with gifts my Tibetan friends have given me over the years (from yak heads to sheep skins). Their hospitality to me isn't just shown in their homes. They bring it with them to my home as well. I want to say thank you to the countless Tibetans I have met over the years who have shown me a form of hospitality I have NEVER been shown in my country. Of all the things I have learned from Tibetans, I hope I never forget how to be a hospitable person. Most Americans are too busy to show real hospitality. Maybe it isn't just that they are busy. Perhaps they just don't care. I know I didn't care about it before I came to Tibet. But after living on the Tibetan Plateau for 5 years, I hope I have changed. Thanks for taking a minute to read this. Drepung Monastery is another of the six great Gelukpa monasteries of Tibet. It is located 5km west of Lhasa in the traditional Tibetan province of U. 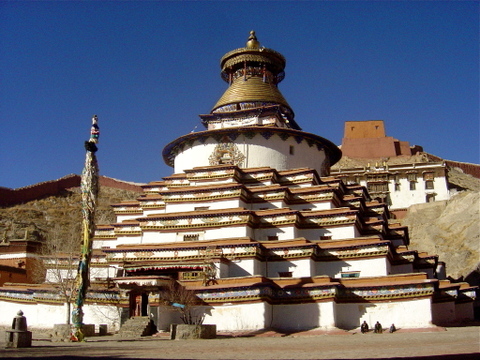 It was founded by Jamyang Chojey in 1416. Jamyang Chojey was a disciple of Tsongkhapa, who was the founder of the Gelukpa sect of Tibetan buddhism. The monastery quickly became popular and had a monk population of nearly 2000 within the first two years of its founding. The first Dalai Lama, Gedun Drup, studied at Drepung monastery under Tsongkhapa. Gedun Drup later went on to found Tashilhunpo monastery in Shigatse. The second through the fifth Dalai Lama's each lived at Drepung and were the thrown holders of the monastery. The tombs of the second to fourth Dalai Lama's are found at Drepung. Starting from the fifth Dalai Lama, the home of Tibet's spiritual leader was moved to the Potala Palace. Drepung was once the largest monastery in the world with a monk population of over 10,000. After the Chinese takeover of Tibet in the 1950's, the monk population fell to only a few hundred. During the Cultural Revolution it was closed, but was later reopened in the early 1980's. Today the monk population of Drepung is around 600. Drepung has been one of the most politically influential monasteries in Tibet throughout its existence. Many of Tibet's most renowned leaders have studied there. Even in more recent times it continues to be influential. In the late 1980's, many monks from Drepung protested against the government by raising the Tibetan flag and marching around the Barkhor. The monks involved were later arrested. During certain times of year (such as Losar), many pilgrims come to Drepung to walk the kora around the monastery. The kora goes around all of the major colleges and assembly halls and continues down to Nechung Monastery, which was home to the state oracle. Losar is the biggest holiday for Tibetans. Losar (Tibetan New Year) takes place sometime between mid-January and mid-February each year. Many Tibetans make a pilgrimmage to the capital city of Lhasa. The picture above is taken from the roof of the famous Jokhang Temple. During Losar, tens of thousands of Tibetans walk around the Jokhang and prostrate in front of it. Many other Tibetans will walk koras around holy lakes and mountains while others will go and seek blessings from lama's. Losar is a great time of year to be in Lhasa. Pilgrims from all areas of Tibet can be found walking the streets. For most of the year Lhasa is overrun with Chinese and foreign tourists. Losar is the only time of year when Lhasa actually feels like it is in Tibet. The much anticipated train to Lhasa opened to the public on July 1, 2006. 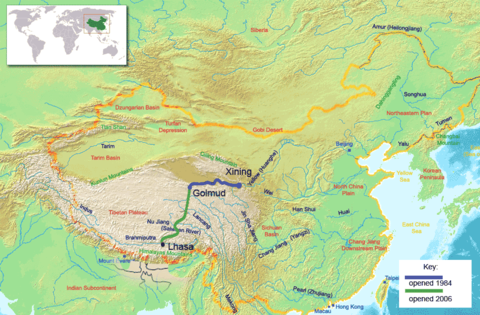 China had spent many years and many billions of dollars building this railway over the frozen northern Tibetan Plateau. Originally, it wasn't to be opened until sometime in 2007, but China had tens of thousands of workers from the eastern provinces come in to speed up the process (there were very few Tibetans working on the construction of the railway to Tibet). The new section of train line extends from Golmud in western Qinghai Province to the Tibetan capital of Lhasa. The distance between Golmud and Lhasa is just under 1150km / 719 miles. It is now possible to take the train all the way across the Tibetan Plateau from Lhasa to Xining. The distance from Lhasa to Xining is 1972km / 1233 miles. I wanted to be among the first people to take this new train line, but I ended up being quite busy when the train began on July 1st. I tried to take the train in mid-July, but the tickets were all sold out for the next 10 days. After looking at the train schedule, I decided to take the bus down to Lhasa and then train back to Xining. Most of the trains going down to Lhasa arrive late at night. Some of the best scenery is between the small town of Amdo and Lhasa, but you are unable to see it because it is dark. So I took the train from Xining to Golmud and then took the bus down to Lhasa as I have done many times before. I arrived in Lhasa on July 31st. Four thousand people per day were arriving in Lhasa on the trains which were originating in Beijing, Chengdu, Chongqing, Lanzhou and Xining (trains from Shanghai and Guangzhou have since been added). I have been to Lhasa many, many times, but have never seen it quite like this. Tourists were everywhere! Walking around the Barkhor one could see more tourists (both foreign and Chinese) than Tibetans. I went to 6 different hotels before I found one with an empty room. Lhasa was known as the "Forbidden City" for centuries. It was a top destination for many adventure explorers in the 18th, 19th and early 20th centuries. Many went out hoping to make it to Lhasa, but few did. Lhasa is anything but a Forbidden City now. It is now one of the top tourist destinations in China and in Asia. As soon as I got checked into a hotel (the Gang Gyan Hotel on Beijing Lu), I made my way over to the new Lhasa train station. The train station is beautiful and is built in Tibetan design. The train station lies 14km from downtown, but a new bridge over the Kyi River will shorten the distance to about 8km. I walked into the ticket hall and was shocked. There were 14 lines all with at least 40 people waiting to buy train tickets! I couldn't believe how many people there were. I toughed it out waiting in line and bought a ticket from Lhasa to Xining. I finally had my train ticket in hand! I spent about 10 days in Lhasa with some of my best Tibetan friends. My friends Lhamo Dhondrup and Namlu made time in their busy schedules to hang out with me everyday. We spent a lot of time playing pool at one of the many local pool halls in Lhasa. At the end of my time in Lhasa I said goodbye to my friends and made my way to the train station. All of the trains going to Lhasa are new. A Canadian company built all of them and they are very nice. They are slightly different than the rest of Chinese trains. A popular rumor about the trains is that they are pressurized like an airplane. That is not true. But, the train is equipped with oxygen outlets in all of the sleeping berths and under every seat. The stewardesses pass out oxygen lines to everyone who wants them and you are free to use the oxygen at no additional cost. Oxygen is available between Lhasa and Golmud and vice-versa. While oxygen is in use, there is no smoking at all on the trains. Train cars in China are supposed to be smoke free, but many people pay no attention to the signs and smoke anyway. I noticed that while the oxygen was in use, the train officials enforced the no smoking rule. The train departed Lhasa at 8am. I couldn't get tickets on the train to Xining (train N918) so I had to settle for tickets on train T28 to Beijing. All the trains stop in Xining so it didn't really matter what train I took. I took a seat next to the window to enjoy the scenery. Even though I had taken this route many times by bus, it was quite different from the train (and much more comfortable!!). There is a reader board in each car that tells you how fast you are going, what the outside temperature is and what the next destination is. Soon after leaving Lhasa, you go through some farming areas. I saw many Tibetans working in their fields. Further north, there were some nomads in yak hair tents grazing their herds. The train passed by a couple of beautiful high elevation lakes and several high mountain passes. The scenery in this area of Tibet is amazing. The train made a couple stops along the way to Xining. The first stop was in the Kham Tibetan town of Nagchu. Nagchu sits at 4500m / 14,760 feet. The only Tibetans I saw on the train got off here. After a 6 or 7 minute stop in Nagchu, we were back on our way. A few hours later we crossed over the Tang Gu La mountain pass. The train pass is about 5082m which is a little lower than the pass the road takes (5231m). I didn't use any oxygen, but many other people were. After crossing the Tang Gu La we went through the vast high altitude grasslands of Kekexili where most of Tibet's Tibetan Antelope live. I saw several large herds of antelope as well as herds of gazelle. A little after 10pm we arrived in Golmud (elevation 2800m / 9184 feet). Almost all of the Chinese tourists got off the train in Golmud and took pictures standing in front of the train station sign. After leaving Golmud, I got settled and slept through the night. The next morning at 9:45 I arrived in Xining. I had taken the new train across the Tibetan Plateau. It was the most comfortable way I had ever traveled to or from Lhasa. 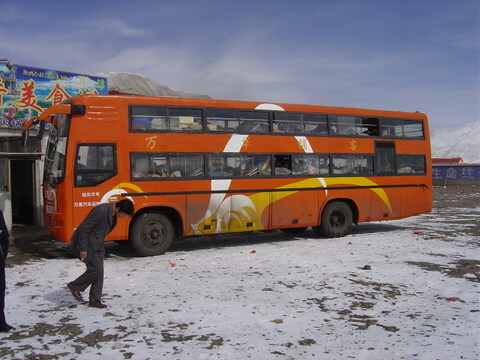 Sleeper buses are one of the main modes of transportation across the Tibetan Plateau. Inside, the bus is divided into 3 rows of bunk beds. The beds are narrow, short and very uncomfortable. Blankets are provided in the bus, but they are very dirty and are never washed. I have had to use blankets that have dried vomit and motor oil on them! In the winter months (October-May) the beds next to the window are very cold. Thick ice forms on the inside of the window. Since the beds are so narrow, one side of your body ends up next to the icy window. Most of the sleeper buses have heat, but there are still a few older ones that have no heat. Winter temperatures can easily drop to -25F (-32C) on the high plateau so getting a bus without heat is a nightmare. 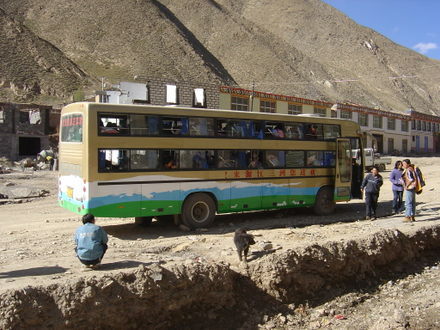 I once took a sleeper bus in the winter from Lhasa to Golmud that didn't have heat. Inside the bus it was easily 0F (-18C). I didn't sleep one minute on that bus ride. It was the worst experience of my life. Many men chain smoke in the buses adding to the misery. Sleeper buses are only available on long distance routes across the Plateau such as Golmud to Lhasa, Xining to Lhasa, Lhasa to Chamdo, Chamdo to Chengdu, Xining to Jyekundo and Lhasa to Ngari. The buses have no bathrooms and only stop for bathroom breaks every 4 hours or so. You have to be careful on how much water you drink since the next stop could be several hours away. Most of the Tibetan Plateau is barren and uninhabited so the bathroom breaks are just out on the open plateau. Men will go to one side of the bus while women go to the other. The bus will also make a stop for lunch or dinner. The bus usualy stops in the middle of nowhere at some small Muslim noodle shop. Most people will bring small snacks along for the long ride. Delays on sleeper buses are common. Flat tires, engine problems and heavy snow can all contribute to delays. Some breakdowns are short while others are for many hours. Most of the route is through some of the most remote areas on earth, so there are few mechanics along the way. The buses are usually manned by a driver and one or two assistants. These guys know how the buses work inside and out so they usually can get the bus running again. Occasionally heavy snow will shut the roads down for a period of time. This is not very common in southern Tibet, but it can happen on the northern Plateau. In February 2006 the buses between Yushu Tibet Autonomous Prefecture and Xining stopped running for over a week due to heavy snow. Altitude sickness is a reality in Tibet. Most of the Plateau sits above 4500m (14,763ft) with passes over 5200m (17,060ft). Most Tibetans don't suffer from altitude sickness, but they do suffer from motion sickness. Many foreigners and Chinese who take sleeper buses in Tibet suffer from altitude sickness. It is not uncommon for people to throw up inside the bus or for the sides on the bus to be covered with throw up by the time it reaches its final destination. I thought I would write a little about sleeper buses since a lot of my life seems to be on them. I frequently take the Lhasa-Golmud (18-22 hours) and Xining-Jyekundo (17-21 hours) buses. I never look forward to the long rides and am always glad when they are over.